This is something I sketched out forever ago (for Great Grandma's quilt in summer 2014!) and never got around to sharing. Now, the #StarstruckQAL is starting in a couple weeks on Instagram, so I figured it was about time to make my graph paper sketch a little more solid! It's not really a tutorial on how to make a sawtooth star - after all, that's a block with a million tutorials dating back to the 1800s. Rather, this is how to cut three 8" sawtooth star blocks from one fat quarter with very little waste, utilizing the "magic flying geese" method. As you can see, your FQ must be at least 20.5x17.25" in order for this to work. Or, if you're like me and it's easier to visualize in fabric, here you go! Layer right sides together with the rest of the 2-7/8" squares, stitch on either side of the line, cut in half. Press toward the outer triangle and trim the dog ears. And there you have four perfect flying geese! And then you just pair them with the coordinating 2.5" squares for the corners, and 4.5" squares for the middles! I pressed the seams toward the squares (not the geese), then pressed the final seams open. And I have the stack of leftovers to make six more blocks! I don't think I'm going to make the eighty blocks necessary for proper Quilts of Valor size - rather, I'm going to mix in some 16" stars. Which I haven't figured out how to cut from one fat quarter yet. I'm really looking forward to the #StarstruckQAL and making a handful of these every week for six weeks! I feel like I've been slacking on my Quilts of Valor (even though the Rail Fence is on-going and will be on-going foreeeeeeever), so it'll be nice to get a donation back to my Washington chapter soon. 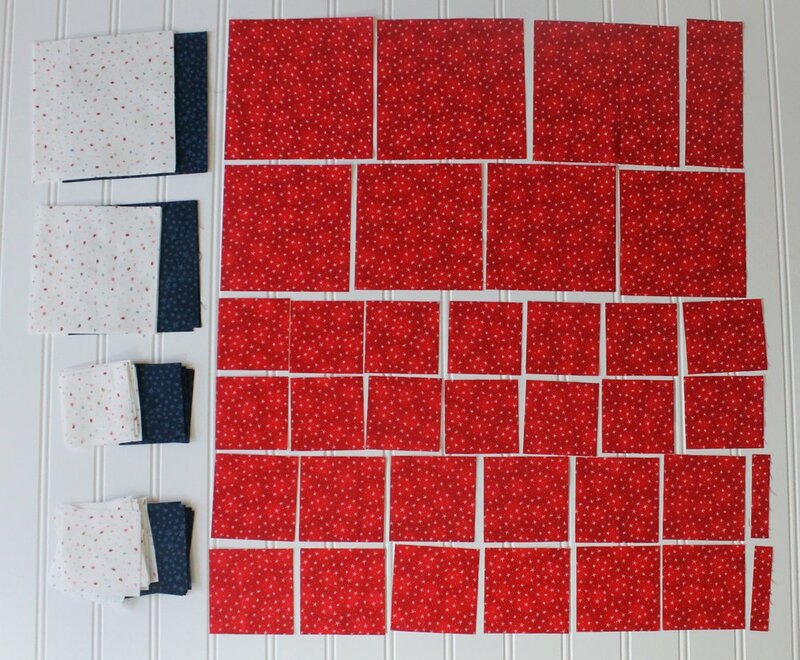 If you're also considering Quilts of Valor and you don't want to stop your stash, here's a couple FQ bundle ideas!